Postperfusion lung syndrome is rare but lethal. Secondary inflammatory response was the popularly accepted theory for the underlying etiology. Respiratory index (RI) and arterial oxygen tension/fractional inspired oxygen can be reliable indices for the diagnosis of this syndrome as X-ray appearance is always insignificant at the early stage of the onset. 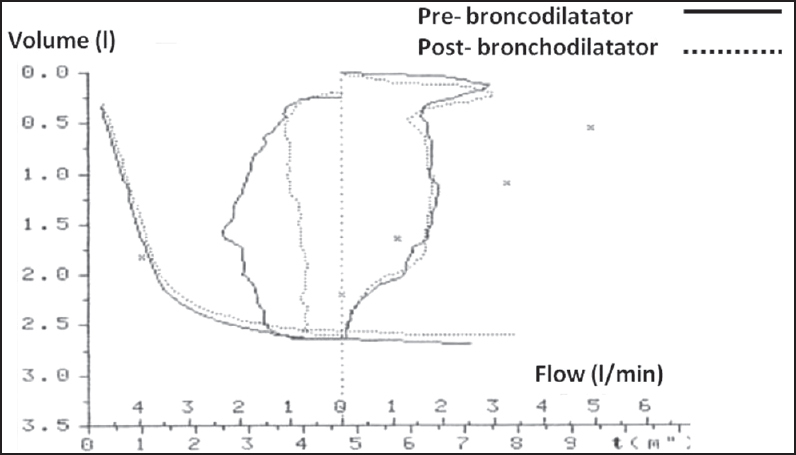 Evaluations of extravascular lung water content and pulmonary compliance are also helpful in the definite diagnosis. Multiorgan failure and triple acid-base disturbances that might develop secondary to postperfusion lung syndrome are responsible for the poor prognosis and increased mortality rather than postperfusion lung syndrome itself. Mechanical ventilation with low tidal volume (TV) and proper positive end-expiratory pressure can be an effective treatment strategy. Use of ulinastatin and propofol may benefit the patients through different mechanisms. Auscultation of the lung is an important part of the respiratory examination and is helpful in diagnosing various respiratory disorders. Auscultation assesses airflow through the trachea-bronchial tree. It is important to distinguish normal respiratory sounds from abnormal ones for example crackles, wheezes, and pleural rub in order to make correct diagnosis. It is necessary to understand the underlying pathophysiology of various lung sounds generation for better understanding of disease processes. Bedside teaching should be strengthened in order to avoid erosion in this age old procedure in the era of technological explosion. Overweight-mortality paradox and impact of six-minute walk distance (SMWD) in lung transplantation Background: The objective of this study was to examine combined prognostic influence of body mass index (BMI) and SMWD on mortality in lung transplant recipients. Methods: Consecutive isolated lung transplant recipients were identified. Preoperative BMI and SMWD data were collected. The cohort was followed for all-cause mortality. Results: The study included 324 lung transplant recipients with mean age of 57 ± 13 years and 58% were male (27% obstructive, 3% vascular, 6% cystic fibrosis, and 64% with restrictive lung diseases). In the total cohort; 37% had normal BMI, 10% were underweight, 33% were overweight, and 20% were obese. The median SMWD was 700 feet. The lower SMWDgroup was defined as the patients who had SMWD <237 feet as determined by receiver operating characteristic (ROC). Based on this definition, 66 patients (20%) had lower SMWD. There were 71 deaths during a median follow-up of 2.3 years. In multivariate analysis, both BMI and SMWD were independently associated with death. Being overweight was associated with reduced mortality risk (hazard ratio (HR) 0.50, P = 0.042) compared to the normal BMI group, and this was primarily driven by early mortality posttransplant. 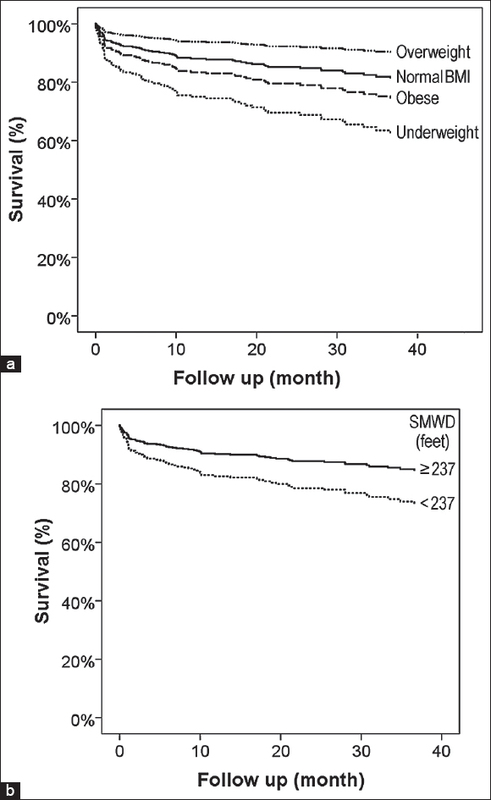 This paradoxical overweight-mortality relationship remained significant in the lower SMWD group (HR 0.075, P = 0.018), but not in the higher SMWD group (P = 0.552). Conclusion: In lung transplant recipients under lung allocation score (LAS) era, pretransplant BMI and SMWD were independent predictors for mortality after the transplant. The lowest mortality risk was noted in a group of transplant recipients identified as overweight; whereas, being underweight or obese was associated with increased mortality. Introduction and Objectives: Bronchiectasis is a pulmonary manifestation that often occurs in individuals with rheumatoid arthritis (RA). Nevertheless, the prevalence of bronchiectasis in RA patients and predictors of its development/progression remain ill-defined. Our objective was to investigate the prevalence of bronchiectasis in a group of RA patients and examine possible clinical or biochemical risk factors that might contribute to its development. Methods: This was an observational study analyzing 100 RA patients with no pulmonary symptoms selected from King Abdulaziz University Hospital in the Western region of Saudi Arabia from October 2013 to 2014. Demographic, clinical and laboratory information were collected for all patients. Diagnosis was based on the 2010 American College of Rheumatology (ACR)/European League Against Rheumatism (EULAR) classification system, and disease activity was assessed using the 28-Joint Disease Activity Score Index with C-reactive protein; high-resolution computed tomography chest scans were performed. The prevalence of bronchiectasis was recorded and its association with different risk factors was examined using standard statistical methods. Results: All 100 patients fulfilled the ACR and EULAR classification criteria for RA diagnosis. Their mean age was 51.05 ± 13.5 years, disease duration was 6.19 ± 6.4 years and disease activity index was 4 ± 1.3 (moderate activity). A total of 35 (35%) patients developed bronchiectasis. Notably, we observed significant positive associations of bronchiectasis with age, disease duration and male gender (P < 0.001, P = 0.006, P = 0.028, respectively). Conclusions: Asymptomatic bronchiectasis represents a common complication in moderately active RA patients within the Western Region of Saudi Arabia. Furthermore, several predictors of bronchiectasis development were identified, which can contribute to effective risk stratification in RA patients. Further prospective studies are needed to detect the prognosis of asymptomatic bronchiectasis in RA patients. Background: For patients that are expected to survive for longer, the risk of complications combined with the need for more vacuum drainage bottles have become barriers to the placement of indwelling pleural catheter (IPC), since these could increase costs. Objetives: The objective of the current article is to determine the cost and efficiency of treating malignant pleural effusion (MPE) with IPC in Spanish hospitals. Methods: We compared the cost associated with the use of IPC per outpatient and per inpatient. We analyzed the number of consultations, length of hospital stay, and outcome of the procedure. Results: Fifty-five patients were recruited. Spontaneous pleurodesis was achieved in 34.4% of the cases. Post-catheterization complications were observed in 7.2%. Supplementary procedures were unnecessary and 87.7% of the patients reported improved dyspnea. In 64.9% of the cases, the IPCs were inserted during hospitalization with a median hospitalization time of 4 days (1-7.5). There were differences in the number of visits with more consultations being observed in the outpatient group. There was no difference in the number of vacuum drainage bottles used. The complications supposed a cost increase of €1045.6 per outpatient and €432.54 per inpatient. The overall average cost of treatment per outpatient was €3310.2 and €5450.3 per inpatient. Conclusions: The treatment with IPC was effective, safe, without need of any more procedures and led to improved dyspnea in more than 85% of the patients. The cost is lower in the outpatient group, although complications represent an increased cost in both groups. Background: We obtained estimates of the incidence of tuberculosis (TB) among patients receiving HIV Treatment. We also modeled the relationship between incident TB and change in CD4 count over the follow-up period. Methods: We analyzed the incidence of TB over 10 years from initiation of HIV treatment among 345 HIV treatment-naοve persons, who were enrolled in a cohort in Kano, Nigeria. We used Generalized Estimating Equation [GEE] to identify determinants of TB incidence and model the relationship between the occurrences of TB with change in CD4 count over the follow-up period. We created Kaplan-Meier curves stratified by anti-retroviral therapy (ART) treatment failure status to examine the effect of first line ART treatment failure on occurrence of TB. Result: During the 10-year period, 47(13.62%) had TB [incidence was 7.43 per (1,000) person year)]. It is associated with decreasing age (OR = 0.98), female gender (OR = 0.83), being on first line ART other than AZT (OR = 0.87), poor adherence (OR = 1.25), change in ART regimen (OR = 2.3) and ART treatment failure (OR = 1.51). 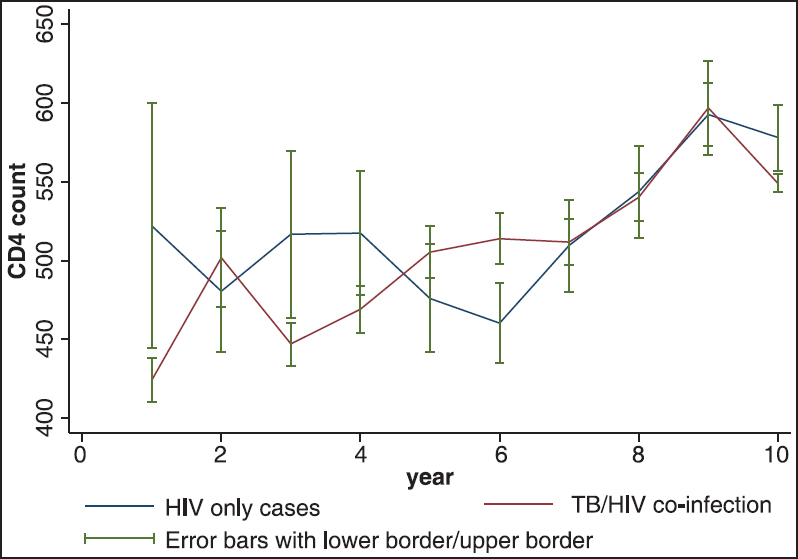 Odds of TB occurrence was also associated with CD4 increment at 10 years (OR = 0.99). Those with TB/HIV co-infection tend to have statistically significant shorter time to failing first line ART regimen compared to those with HIV infection alone. Conclusion: There was high incidence of TB in the studied HIV cohort with a deleterious effect on the outcome of ART treatment. There is need for early TB screening and re-screening among all HIV patients. Background and Aim: The prevalence of restless legs syndrome (RLS) in the general population ranges from 5 to 15%; however, locally, such data are scarce. The aim of this study was to estimate the prevalence of RLS in the middle-aged Saudi population. Methods : This was a cross-sectional study that was conducted from February 2013 to June 2013 in Jeddah, Saudi Arabia. The target study population was Saudi school employees. Saudi employees aged 30-60 years were randomly selected and interviewed individually. Trained interviewers completed the Wisconsin Sleep Questionnaire, questions about demographics, the Epworth Sleepiness Scale to measure daytime sleepiness, and questions regarding symptoms of RLS based on the criteria defined by the International Restless Legs Syndrome Study Group (IRLSSG). Results: This survey revealed that 8.4% (95% confidence interval (CI): (7.35-9.45)) of the 2,682 participants (62.5% of them were males) had RLS. There was no age effect on the prevalence of RLS. RLS was found to be significantly associated with other sleep disorders, including excessive daytime sleepiness and habitual snoring. A univariate analysis revealed significant correlation of many factors with the RLS, including gender, consanguinity, snoring, diabetes, hypertension, asthma, chronic bronchitis, and smoking. However, when a multivariate logistic regression analysis performed, RLS continued to be associated with male gender, diabetes, asthma, and habitual snoring only. Conclusion: The prevalence of RLS is 8.4%, which is within the range reported by Western studies. However, unlike findings of most studies, RLS significantly affects males more than females. In addition, snoring, asthma, and consanguinity are potential new risk factors for RLS. Background and Aim: Obstructive sleep apnea syndrome (OSAS) is an independent risk factor for cardiovascular disease. Recent studies showed endothelial dysfunction and pentraxin-3 both of an early marker for development of cardiovascular disease. The aim of the study was to evaluate the relationship between severity of OSAS and endothelial dysfunction and inflammatory markers including pentraxin-3 and high-sensitivity C-reactive protein (hs-CRP). Methods: This was a cross-sectional study in which patients who had undergone a polysomnographic study for diagnosis of OSAS were recruited. Included patients were grouped according to apnea-hypopnea index (AHI) as mild (AHI between 5 and 14.9) and moderate-severe OSAS (AHI ΃ 15). Patients with AHI < 5 served as control group. Endothelial function was evaluated by flow-mediated dilatation (FMD). Serum pentraxin-3 and hs-CRP levels were measured. Results: Eighty-three patients enrolled for the study. We found a significant increment in pentraxin-3 and hs-CRP levels and a significant decrement in FMD as the severity of OSAS increased. There was a negative correlation between FMD and AHI, pentraxin, and hs-CRP. Conclusion: OSAS patients have significantly elevated pentraxin-3 levels and endothelial dysfunction. 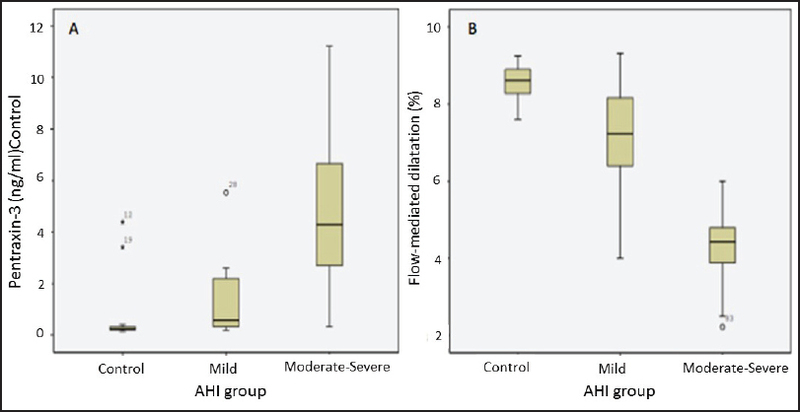 Furthermore, both pentraxin-3 and endothelial dysfunction were independently associated with severity of OSAS defined by AHI. Aims: The purpose of this study is to present our center's experience in managing patients with pulmonary arterial hypertension (PAH). The main objective is to describe patients' management profile and treatment outcome. Methods: This study presents the results from a single pulmonary hypertension (PH) specialized center in Saudi Arabia. Both incidence and prevalence cases are included. We have previously reported the clinical and physiological characteristics at the time of diagnosis for this cohort of patients. In this study, we describe the clinical management and the outcome of therapy in the same cohort, who were prospectively followed for a mean of 22 months. Results: A total of 107 patients were identified as having PAH. At the time of enrollment, 56.1% of patients were in modified New York Heart Association functional class (NYHA FC) III and 16.8% were in IV. Phosphdiesterase-5 inhibitor was the most commonly used target therapy (82.2%) followed by endothelin receptors antagonist (74.4%). Only five patients (4.7%) were candidate to use calcium channel blockers. Seventy-nine patients (73.8 %) received a combination nonparenteral target therapy. Thirty-one patients (28.9%) died during the follow-up period. Modified NYHA FC III and IV patients, portopulmonary hypertension, heritable PAH, and PAH associated with connective tissue diseases had the highest mortality rate (P < 0.001). Conclusion: Our patients are detected at advanced stage of the disease, and thus the mortality is still unacceptably high. Advanced functional class at presentation and certain disease subgroups are associated with increased mortality. Amyloidosis may involve the respiratory system with different clinical-radiological-functional patterns which are not always easy to be recognized. A good level of knowledge of the disease, an active integration of the pulmonologist within a multidisciplinary setting and a high level of clinical suspicion are necessary for an early diagnosis of respiratory amyloidosis. The aim of this retrospective study was to evaluate the number and the patterns of amyloidosis involving the respiratory system. 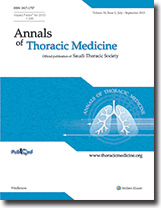 We searched the cases of amyloidosis among patients attending the multidisciplinary rare and diffuse lung disease outpatients' clinic of Pulmonology Unit of the Hospital of Arezzo from 2007 to 2012. Among the 298 patients evaluated during the study period, we identified three cases of amyloidosis with involvement of the respiratory system, associated or not with other extra-thoracic localizations, whose diagnosis was histo-pathologically confirmed after the pulmonologist, the radiologist, and the pathologist evaluation. Our experience of a multidisciplinary team confirms that intra-thoracic amyloidosis is an uncommon disorder, representing 1.0% of the cases of rare and diffuse lung diseases referred to our center. The diagnosis of the disease is not always easy and quick as the amyloidosis may involve different parts of the respiratory system (airways, pleura, parenchyma). It is therefore recommended to remind this orphan disease in the differential diagnosis of the wide clinical scenarios the pulmonologist may intercept in clinical practice.